The BlackBerry Storm, nee Thunder, debuted today after much rumour and speculation on the internet, and based on the specs it doesn't disappoint. Using a 'suspension system' in the 3.25-inch, 480 x 360 touchscreen, users can feel a click when areas are pressed, helping all those QWERTY fans make the move to the first ever full touchscreen device from RIM. The same screen also supports – wait for it – multi-touch gestures, which is a bit like a certain other phone we know and love / loathe. 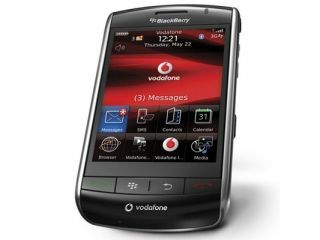 The surprises beyond that are limited – spy shots confirmed the presence of a 3.2MP camera, which is still more than adequate for RIM's line-up, especially with auto-focus, and GPS for geo-tagging and location-based fun. RIM has also thrown in its proprietary BlackBerry Maps application for those moments when you want to find out where you are and such, taking on the heavyweight Google's and Nokia's (sort of) similar apps. 3G is there (well, in 2,100MHz connections, anyway) but there's no presence of Wi-Fi, which is a bit strange and sure to displease a few. The battery is a whopping 1400mAh, which gives six hours' talk time on 3G networks and 15 days of standby time. RIM is also cocking a snook to Apple as well with its new device, stating "other relevant features, such as cut and paste, are only a touch away for the ultimate smartphone experience," in the press release. The accelerometer allows easy switching between landscape and portrait modes, with SureType available in portrait for those stalwart BlackBerry users, as well as the now standard QWERTY in landscape for touch devices. This is clearly RIM's biggest push to get its phones well into the media market, and 1GB of on-board memory storage, as well as microSDHC support up to 16GB, you can pack a fair amount of tunes and movies on there too. Vodafone is the official carrier of the device in the UK, but we've got no word on how long it will take to get here, as "Additional details related to availability and pricing will be announced in the coming weeks."